In my last post on Apple's "low-cost" iPhone, I had estimated that the unsubsidized launch price could range from $300 to $350, based on a few assumptions. However, over the last few months, it has become clear that those assumptions no longer hold good. Based on recent leaks, let's take another look at Apple's strategy with the rumored iPhone 5C. In my previous post, I had estimated a BOM of $145 for the low-cost iPhone with the assumption that the device would feature the iPhone 4S's internals with a plastic case. However, leaks surrounding the iPhone 5C have described a device with the iPhone5's internals. This would increase the BOM to $155-$160, excluding packaging, IP and warranty costs. Other analysts have pegged these costs at $40-$50, which means that total direct costs for the device are likely to be above $200. This also means that any price estimate in the $200-$250 range is just fantasy. At this point, I usually reach a price estimate based on Apple's gross margin expectations. However, I'm beginning to think that Apple may have other, more important constraints to deal with. Let's take a look at a few potential iPhone 5C scenarios and pricing options that Apple may have to wade through. At this point, I see this as the most likely scenario. Most analysts have been assuming that the iPhone 5C would replace the iPhone 4S as Apple's low-end offering and the iPhone 5 would become Apple's mid-range device. However, if the iPhone 5C does indeed have the same internals as the iPhone 5, the plastic case and color options aren't enough to differentiate the "mid-range" product from the "low-end" product. This also makes Apple's move to the lightning port and 4" screen size consistent across the entire iPhone portfolio. In terms of unsubsidized pricing, I don't see any way the iPhone 5C can be priced below $400. This is because Apple's current "low-end" offering retails at $450, while it is available for free from carriers. A substantial cut in the iPhone 5C's unsubsidized price is unlikely to increase volumes in subsidized markets (still available for $0), but Apple would effectively be "leaving money on the table", especially in Apple's core, subsidized markets. 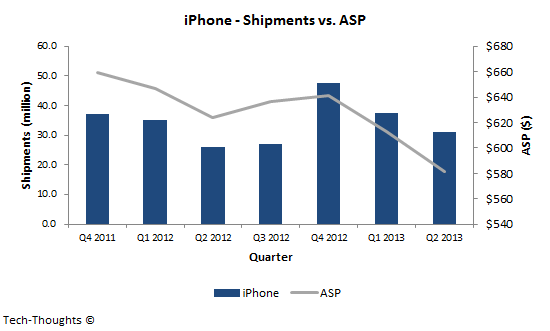 Therefore, consistent with a tip to Ben Thompson, I think Apple is leaning towards $450. I think they could go as low as $400, if it helps facilitate a deal with China Mobile. However, it would not help Apple compete much more effectively in unsubsidized/prepaid markets. To minimize revenue loss from the elimination of the mid-range $550 iPhone, Apple may be banking on spreading potential buyers between high-end and low-end offerings. In terms of subsidized pricing, the iPhone 5S become Apple's flagship device ($200), while the iPhone 5C would bring up the bottom ($0). There have been some rumblings about the iPhone 5C's subsidized price starting at $100, but without a "free" offering iPhone volumes would see major volume in subsidized markets, especially the US. But again, if this reduced subsidy could facilitate a deal with China Mobile, and the increased volumes that would bring, I think Apple would consider it. This is just a slight modification of the first scenario, and in my opinion, the second most likely path. In this scenario, the iPhone 4S would replace the iPhone 4 as Apple's "low-end" offering ($450 unsubsidized, free on contract), the iPhone 5C would be Apple's mid-range offering ($500-$550 unsubsidized, $100 on contract) and the 5S would be Apple's flagship. This is a possibility because Apple has already set a precedent of discontinuing a more recent product and continuing with an older, cheaper variant (iPad 4 replaced iPad 3, iPad 2 continued). Another reason is that this ensures that the iPhone range hits three separate price points. In this case, the rationale for introducing the iPhone 5C would be to soak up the additional margin in the mid-range bucket. Just as in scenario 1, this pricing structure ensures that Apple does not leave "money on the table" in subsidized markets. However, the problem is that I don't see a commercial incentive for China Mobile to sign a deal with Apple, nor do I see how this helps Apple compete in unsubsidized, emerging markets. I think Apple may be incredibly wary of leaving "money on the table" and is likely to opt for a pricing strategy that is defensive rather than one that eliminates the "price umbrella" for competitors. However, safeguarding their revenue stream in subsidized markets leaves them vulnerable to continued low-end disruption in unsubsidized markets, which are likely to drive a significant portion of smartphone sales over the next few years.